Perfect as baby sitters, friends of the elderly, extremely intelligent and reliable. If you get to know a Golden Retriever, you will easily understand why it is considered a perfect dog. trievers are trained to retrieve hunting game as a trophy. Even if bred with the main goal to hunt as retriever, its characteristics make golden retriever an extraordinary companion for people of all ages and physical conditions. 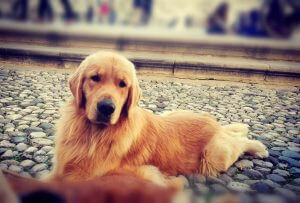 Term golden is referred to its coat, of golden colour, fringed and straight, while retrieve to its main activity. The coat of the American Golden is more curly, straight or with an increasingly golden color and with more ‘powerful structure. Golden’s size is medium and the appearance is harmonious and balanced. The movement is smooth, but powerful, capable of good push and the pace is long and free. 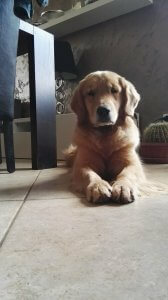 One of the main Golden’s characteristics are the eyes, intense brown colour, surrounded by dark borders, they stand out for the gentle expression. Some call the Golden as a “perfect” dog due to its unique character. This breed has many positive qualities. Golden is extremely adaptable to any type of environment. If raised in a healthy environment, it is far from being aggressive or nervous. One of Golden’s peculiarities is its irrepressible enthusiasm. Suitable for pet therapy. In this context Golden is especially used in long period recovery. There are unfortunately many diseases and disorders that force patients to the bed, even for long periods. Golden Retrievers can help to eliminate the loneliness and depression that often come up in these cases.